Lotus root (renkon in Japanese) is not the most familiar ingredient to most. In fact, unless you reside in the Far East, chances are that you will not come across this odd looking vegetable at all. Saying that, it is now getting more common here in Britain and you can find them stocked in all good oriental supermarkets, normally sold vacuum packed to preserve the freshness. It is not really a root but the rhizome of the lotus flower. For the Buddhist, it is a symbol of purity as although it's grown in muddy condition, it is consider pure and clean. It has a knobby appearance and look a bit like ginger on steroid. Quite a scary comparison but most apt when you look at it. However, do not let it's hideous exterior deters you from trying this unique vegetable. 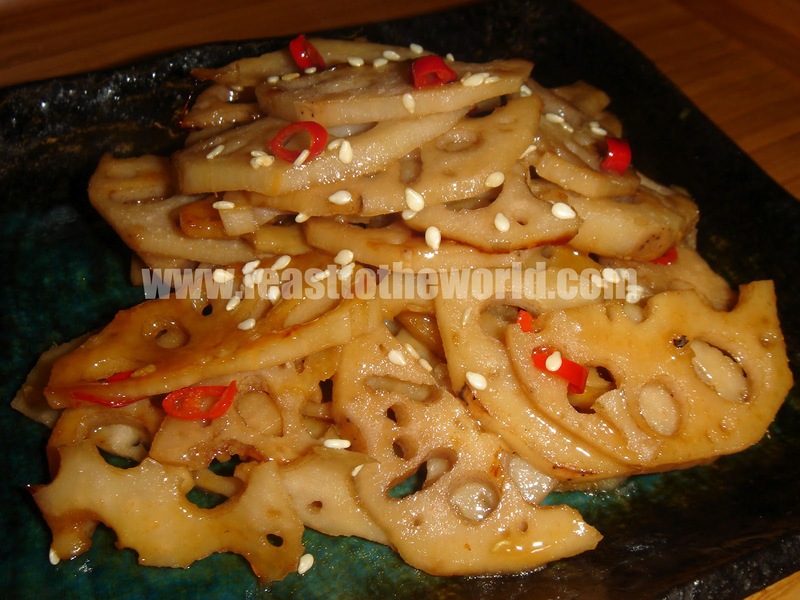 It has small holes throughout it's length which, when sliced open, revealed the most intricate lattice design like a beautiful blossom flower. It has a delicate and sweet flavour along with a crispy crunchy texture. Absolutely delicious when served raw in a salad. Once cooked, it retain most of its crunchiness and is a great absorber of flavours, perfect for stew or other braising dishes. 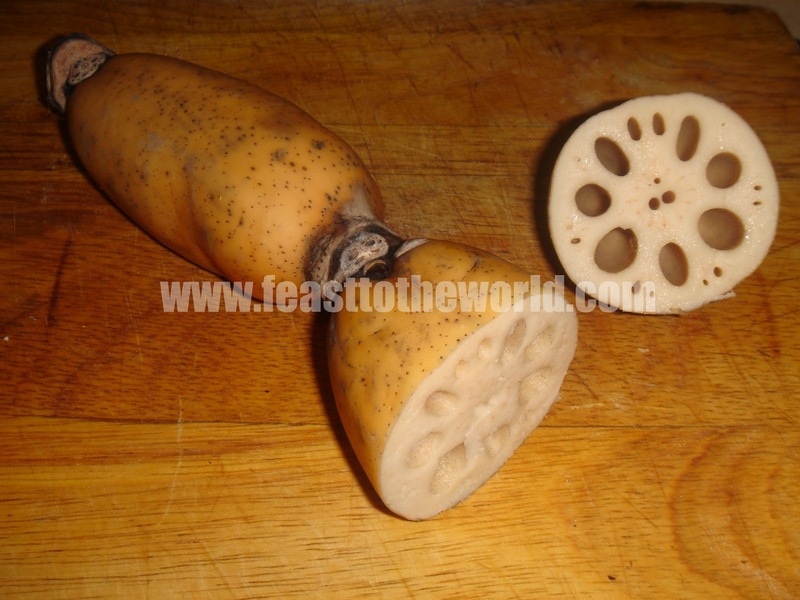 For those who has never has the fortune of savouring this truly delectable vegetable, this is a simple way of showcasing this wonderful vegetable to it's full potential. By slow braising it in the sweet mirin and soy sauce, it takes in all the yumminess and what you get is a crisp, spicy and tasty dish. Peel the lotus root and thinly sliced into half-moon shapes. Soak in a bowl of water with the vinegar for 5 minutes to remove any bitterness. Drain and wipe dry. 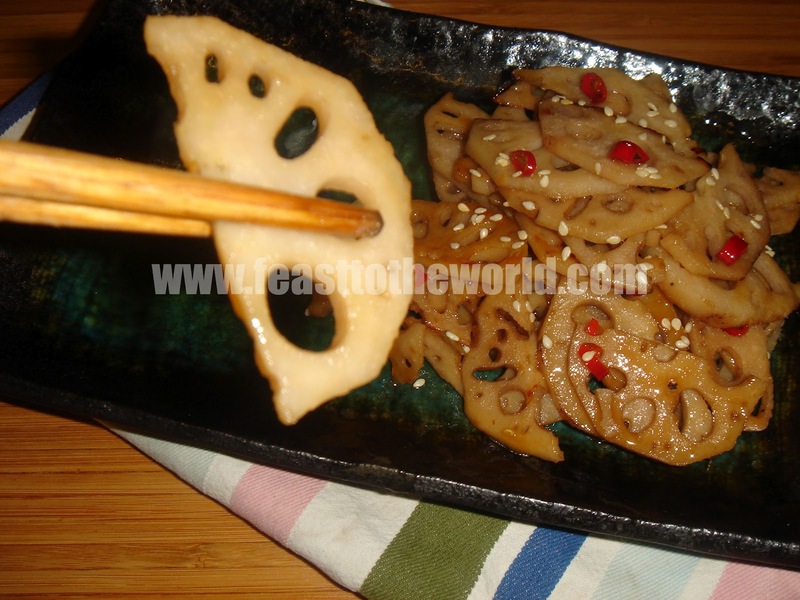 Heat the sesame oil in a pan over medium heat. 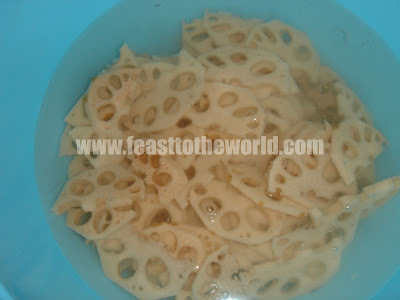 Fry lotus root and for 1 minute, until it turn translucent. Add the chopped chillies, sake, sugar, soy sauce and mirin . Simmer for another 2-3 minutes or until most of the liquid has been reduced and you are left with a thick, sticky sauce. 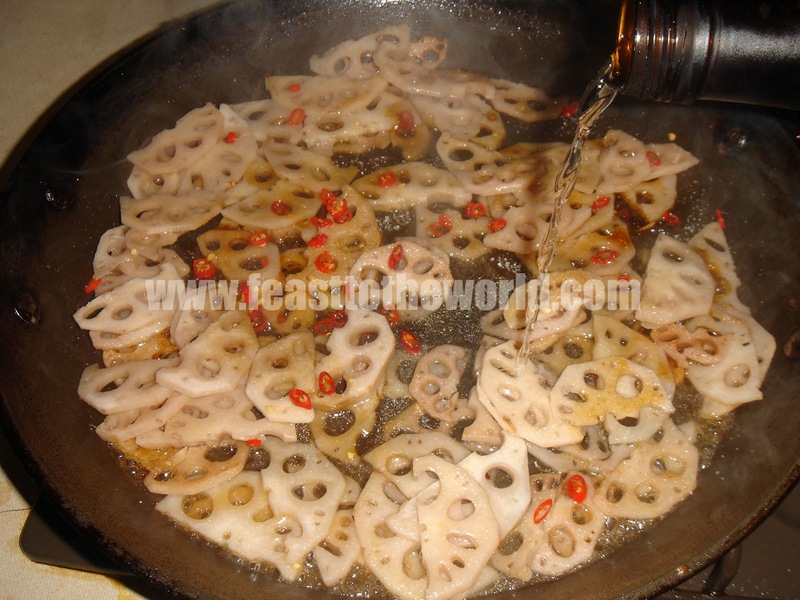 Serve sprinkled with the toasted sesame seeds and a bowl of steamed rice.